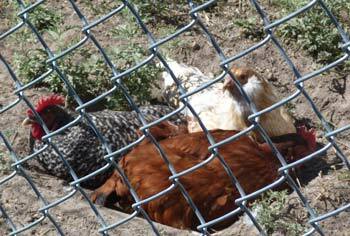 We have three chickens. Coconut……She’s my favorite. She’s great. I know, you shouldn’t have favorites right? Well, she’s ours. She’s a sweetie. 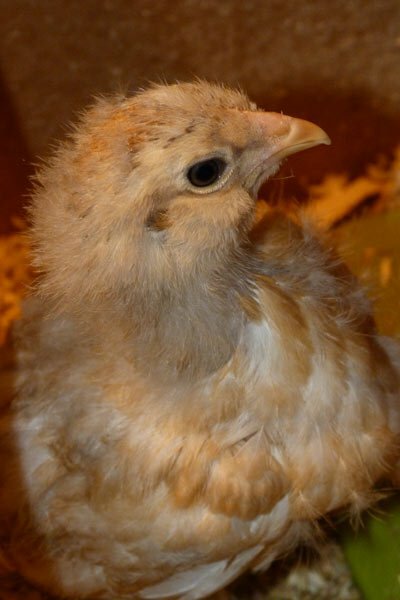 She’s an Americauna/Americana…..and Easter egg chicken. She’ll fly up on hubbys shoulder when he goes out in the run. When my son goes out to feed them, she jumps on his feet. Unfortunately when she grew up, her beak developed poorly. Her beak is crossed and cannot close. She has a real hard time eating, but over the months has become accustomed to it, and works around her deformity. But because she is ‘deformed’, the other girls pick on her. Her best friend is our Flemish Giant, Jasper. She hangs out with him, and he protects her. It really is adorable. 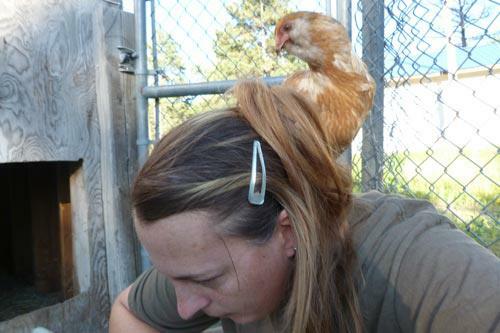 We worried about her immensely because it seemed she wasn’t eating much of her chicken scratch. She seemed to like the rabbit pellets more. Although we gave the chickens alot of table scraps, she had a hard time eating them. She couldn’t grab onto it, though she tried real hard. We found a couple things she really liked and could easily eat….bananas & oatmeal. She seemed to be thriving fine. 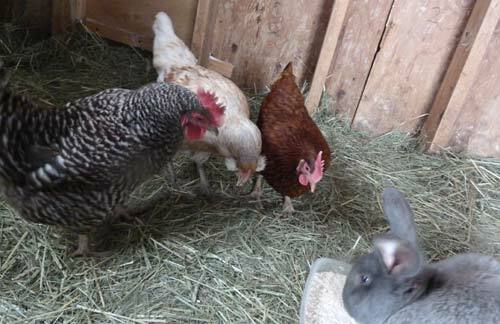 When the girls turned 3-4 months old they started laying eggs. All but Coconut. 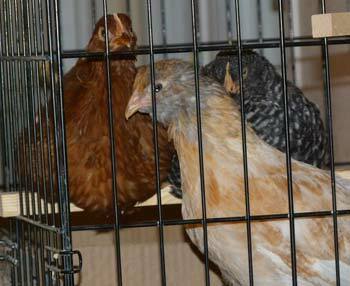 We have Marsala, a Rhode island red, and Peppercorn, a barred rock. 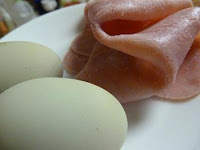 They are both brown egg layers. We figured she was a late bloomer. After a couple months, we were worried she just wasn’t going to lay eggs. Maybe she was malnourished after all. Maybe her deformity went beyond her beak. Oh well, she was still our favorite. 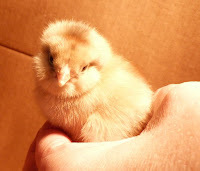 In December I went out to the coop and there was a soft-shelled egg. It was odd. Never seen one like that. It was the color of split-pea soup and really squishy. Blech. I was hoping one of the chickies weren’t sick or something. A couple days later I found a semi-hard shelled egg. This one had more of a light green shade. A few days later, Coconut laid her first egg! Huge egg too. 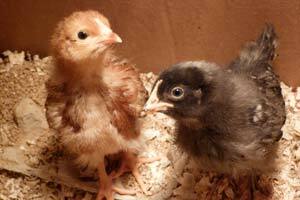 Most chickens start laying at about 22 weeks, and their eggs start off small and gradually grow to x-lg or jumbo size. She didn’t lay her first egg until she was eight months old, and never a small one. From none to huge. A couple weeks ago my son came in with two green eggs. I thought we had missed one the day before. However, it kept happening. I didn’t understand. I open the coop and collect eggs in the morning, then my son closes the coop and collects the eggs laid that day. Each of us would get a green egg many times. Not all days, but sometimes. 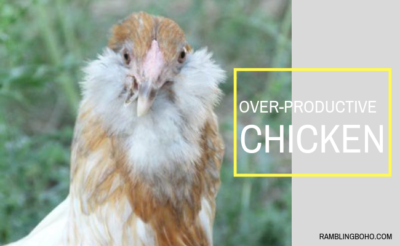 Now, usually, a chicken will lay one egg every 24-26 hours. With the short winter days, even less. Sometimes they’ll stop altogether until spring. However, due to the cold, I’ve kept a heat lamp on in the coop when the sun goes down & before it comes up, extending the girl’s daylight hours. Not really sure about the timing, but we had gotten 3 green eggs in a 36 hr time period. Two more the next day. This girl is cranking them out! But in all actuality I’m kinda worried. I don’t want her to over-tax herself & get sick or hurt. I’ll be getting a red lamp soon to replace the white so we can keep the heat, but the girl’s daylight hours will be reduced. I hope that will curb her egg production. Green eggs & ham, anyone? All her eggs are huge, and very hard-shelled. They are hard to crack, and very yummy, so I know she’s still healthy.